When Rews came to Manchester in February, we knew little of them other than a recommendation. Forty minutes later, they were marked down as one of the bands we knew were destined for much bigger things after a set full of raw energy, power and a set of songs that simply got better as it went on. 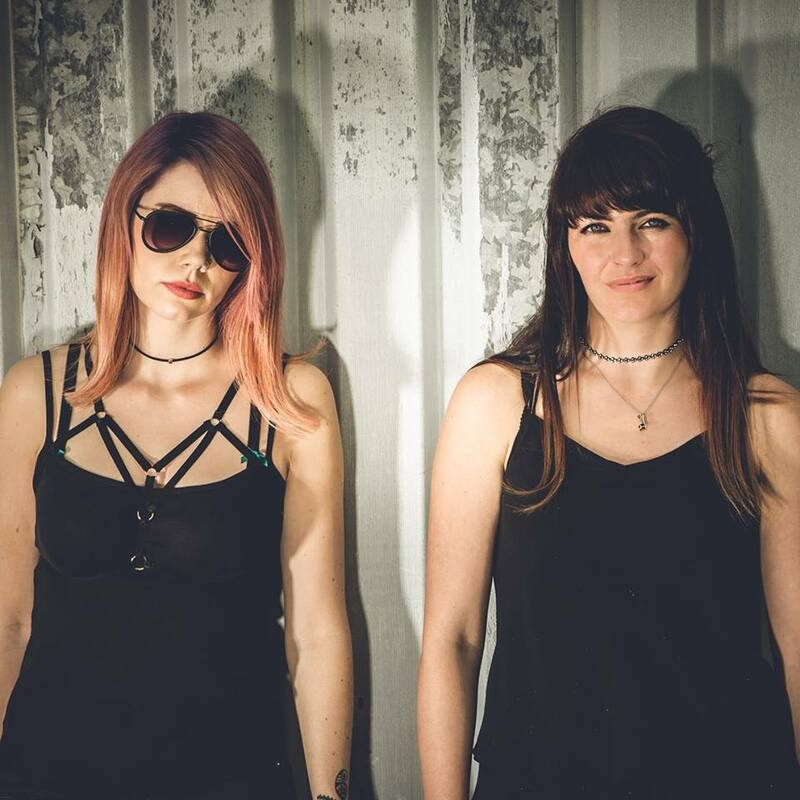 Soon after they got snapped up by Marshall Records and recorded their debut album Pyro over the spring and summer whilst hitting the festival circuit. First of all could you introduce Rews and tell us a little bit about how you got together? We are a high energy, feel good rock duo consisting of multi-instrumentalists Shauna Tohill (N.Ireland) and Collette Williams (Northamptionshire). We were introduced randomly through a friend who thought we would work well together musically. After some online exchanges, we met, jammed over some ideas, and the rest is now history in the making! It's inspired by the Dutch surname ‘Reus’ which means the tall (or giant) people. It was first found scribbled on the wall of a toilet in an underground club!! But once the meaning was looked into, it really fitted with what the Rews ethos is, we aspire to stand out and really make a difference - and we are also quite tall! haha! Do you write songs together or does one or both of you bring ideas to work on together? We do a bit of everything! Usually one of us bring an idea to the table and we work it from there but there are times when we start from scratch, jam and write together! You recorded parts of Pyro at Abbey Road. What was it like working in such a legendary studio complex? It was absolutely phenomenal! We actually had to pinch ourselves when we arrived! It was fantastic! The team were so welcoming, professional and friendly which really filled us with confidence to do our best performance!! :) The place is soaking in history! What are your favourite songs on the album, and why? Shauna : It a difficult question as I feel they are all our babies and its hard to pick a favourite, but at this moment, it is likely We Explode. It is a very deep one emotionally (although it might not seem it). I enjoy playing the guitar in this one and love singing it. Its also a very fun one to play live as it is so erratic but allows Collette and I to really lock in. Your social media is full of pictures of the two of you having a ball. Is being in Rews as much fun as it looks? It’s been a bit of a crazy year for you. What have been the highlights? Highlight for both of us would have to be Glastonbury, playing the John Peel Stage! Wow! It was just mind-blowing!!! And what do you have planned for the rest of the year and into 2018? Some of our readers won’t have heard you before or only seen the lazy “female Royal Blood” descriptions. How would you describe yourselves to someone who hasn’t heard you before? I guess we would go with the high energy, in your face, feel good, full on rock duo! Our songs have pop elements that will hook people in & make you want to sing along ! Its been said by our fans that our energy is infectious and that we make ALOT of sound for only two people… we have the best fun! Rews' official site can be found here and they are on Facebook and Twitter. Pyro is out on November 3rd and their tour hits Oxford Wheatsheaf (8), Norwich Epic Studios (9), Leicester The Soundhouse (10), Bedford Esquires (11), Sheffield Greystones (15), York Fibbers (16), Bury Met (17), Scunthorpe Lincoln Imp (18), St Albans The Horn (22), Tunbridge Wells Forum (23), Reading Face Bar (24), Birmingham Actress & Bishop (25), London Old Blue Last (29), Cardiff Gwidhw (30), Bristol Mr Wolf's (December 1) and Aldershot West End Centre (2).